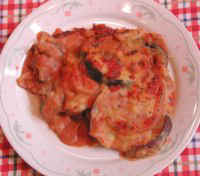 We cook the eggplant casserole in our microwave oven in about 40 minutes, but it can also be cooked in a conventional oven at 350 degrees F. until the eggplant is tender (about 1-1/2 hours). We begin by washing the eggplants and removing the stem and bottom ends and any blemishes. Wash and peel the onions and garlic. Thinly slice the onions. Open the cans. Drain the liquid off the beans, and add the beans to the container of a high speed blender. Add the peeled garlic, nutritional yeast, lemon juice, corn starch, and chipotle pepper (or hot sauce if you prefer). Cover the container and run the blender at high speed until the ingredients are creamy smooth. (Eggplant) Place a small amount of crushed tomatoes on the bottom of the baking dish. 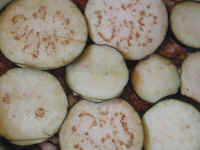 Cut the eggplant into 1/3 inch thick slices and arrange in a tight, non-overlapping layer. 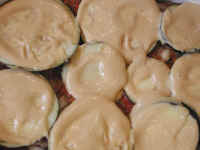 (Bean Cream Sauce) Next, spoon on a thin layer of the bean cream sauce, as shone in the photo. 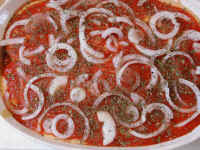 (Crushed tomatoes and onions) Then spoon on a layer of crushed tomatoes. Scatter on some of the onions, separating and breaking up the larger rings. Sprinkle on a little oregano. Repeat the above steps until the casserole is filled and the ingredients are all used. 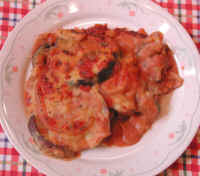 (Baking) Cover the casserole dish, and place in the oven and bake until the eggplant is tender. The tenderness can be tested with a small sharp pointed knife. There should be little or no resistance when pushed into the cooked casserole in several places (to compare the difference, stick the knife in before baking to feel the difference in resistance with that of the cooked casserole). We suggest removing the cover for the last ten to fifteen minutes of cooking in order to firm and brown off the top. (Serving) Remove the casserole from the oven, let cool for a few minutes and, using a sharp knife, slice the casserole lengthwise and twice across to make 6 equal-sized portions. Scoop out each portion onto a plate. 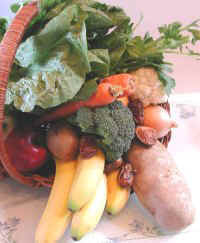 Leftovers can be stored in the covered casserole in the refrigerator for a couple of days. 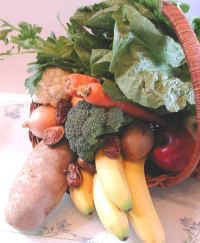 Serve with a large tossed salad and enjoy.